Dubai: The 2019 UAE Classic season kicks off on Thursday as the mighty Godolphin stable pursue an 11th victory in the 1,000 Guineas for three-year-old fillies. The event takes centre stage at Meydan Racecourse in ‘Week 5’ of the Dubai World Cup Carnival. Given the stable’s record, and the imperious form that it has been in all season, Godolphin’s runners are widely expected to be top of the pecking order in the big races. However, Emirati handler Esmail Mohammad appears to have strong claims of beating them at their own game with exciting dual Meydan winner Al Hayette. The American-bred daughter of Union Rags, who is also owned by Mohammad, has caught the eye of many with the way she has dominated her rivals in typically commanding style. Godolphin send out four contenders headed by trainer Charlie Appleby’s debut winner Divine Image (William Buick) who was an impressive six-length winner in a Polytrack novices’ race at Chelmsford City, UK, in December. Epsom Derby and Melbourne Cup-winning Appleby also sends out Lover’s Knot (James Doyle), who makes her first appearance since winning a six-furlong turf contest at Newmarket in July. Appleby is looking for a first success in the race, while his Godolphin teammate Saeed Bin Surour, a 10-time 1,000 Guineas-winning handler, is doubly represented with Swift Rose (Kevin Stott) and Dubai Beauty (Christophe Soumillon). They finished fifth and 14th respectively in the 1,000 Guineas Trial on January 3. Appleby commented: “This will be [Divine Image’s] first start on dirt and we are mindful that a potential lack of experience could count against her, but she showed a good level of ability on her only start”. Swedish handler Mme Pia Brandt seeks her first Carnival winner since 2014 with French scorer Silva. Thursday’s card also features the Group 3 Al Shindagha Sprint, a lead-up race to the $2.5 million (Dh9.18 million) Dubai Golden Shaheen on Dubai World Cup night, that has attracted a small but quality field of six runners. UAE champion trainer Doug Watson accounts for two of the sextet including last year’s winner My Catch and three-time Meydan scorer Drafted, while multiple US. Champion trainer Steve Asmussen runs Switzerland who is owned by Godolphin Mile (G2)-winning owner Shaikh Rashid Bin Humaid Al Nuaimi. 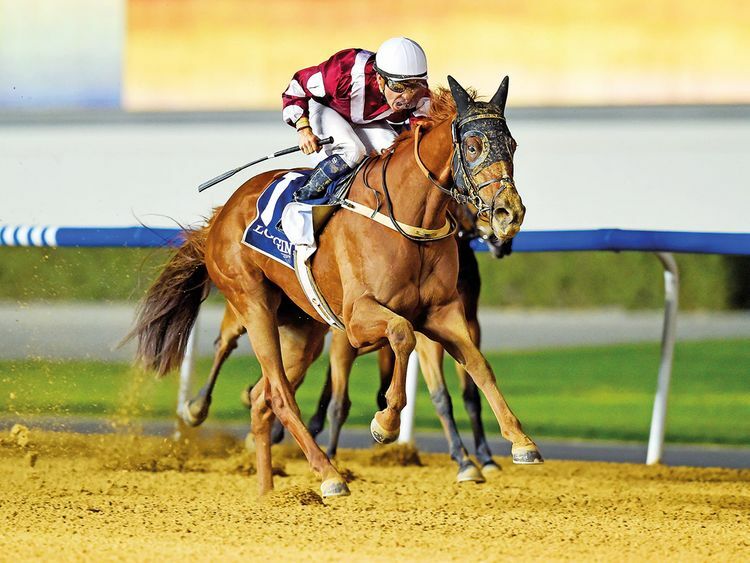 UAE 1,000 Guineas Trial runner-up Nashirah (Brett Doyle) switches back to turf for the seven-furlong Meydan Classic Trial — a race that has also attracted two runners from Bin Suroor’s Al Quoz Stables, Burj (Kevin Stott) and Magic Image (Hayley Turner).